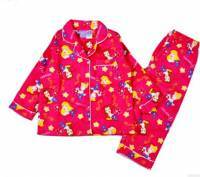 Size 8 Disney Princess Flannelette Children's Winter Pyjamas. This two piece Disney Princess pyjama set is 100% cotton. These Disney Princess Pyjamas are also available in Size 2, Size 3, Size 4, Size 5, and Size 6.